A fit dog is a healthy dog! Keeping your dog fit is an important part of being a pet parent and this class will help you do that. Designed for all levels of fitness, dogs that need to drop a few pounds and dogs that are training for Canine Sports like Fly Ball or Agility will benefit from this class. 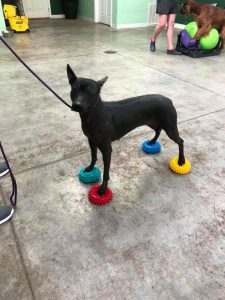 Fit Fido-Canine Conditioning Class is a fantastic class for sport dogs to take during their off season to help improve your performance during competition season. This unique class is taught by Marisha who is a certified Canine Conditioning Coach. 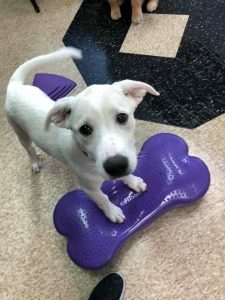 She will use different techniques such as stretches and muscle building exercises to help your dog be the best they can be. We will even include some fun games too :). For safety reasons dog’s must be at least 9 months of age for this class. 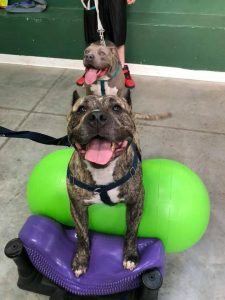 This class will have dogs and owners waiting in line close to each other for some exercises, because of this dogs must be both dog and people friendly to participate. This is a 4 week class and costs $75. To see when our next Fit Fido- Canine Conditioning class is starting please check our group class schedule.